The original article was featured in Small Change NGO (https://goo.gl/7dOAmy) on March 9, 2017. CHANGE leaders do great things, and often that is all we know about them. Here we want to get a different glimpse of the personalities that constitute the development space. Every month we ask one leader to answer our four quirky questions. This week we catch up with AKSHAI ABRAHAM, the founder of Project Khel. Project Khel imparts life-skills to transform adolescents into informed and gender-sensitive citizens and leaders in their communities. The limited exposure to opportunities for learning gravely affects underprivileged youngsters in India resulting in low levels of basic life skills that restrict their personal, social and cognitive growth. 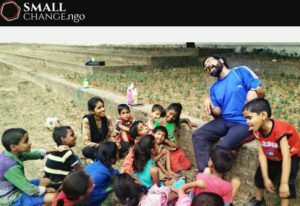 Lucknow-based Project Khel creates safe learning spaces and provides holistic, interactive and experiential learning through story-telling, theatre, dance, and games. After a decade into a lucrative job in development, Akshai decided to leave and start Project Khel, a perfect mix of his love for sports and co-curriculars and his interest in working for the underprivileged at the grassroots level. Small Change: Do you believe in the afterlife? A.A: Not in the afterlife but I do believe in karma (in this life itself). So one should “do good” to attract good for oneself in this life. That way, even if there IS an afterlife, it’s been pre-emptively taken care of. Small Change: Name one thing you are really bad at? A.A: Just one? Hmm… if it has to be one, then I guess I’ll say “socialising” or “networking”. Small Change: You have been forced to eat only four things for the rest of your life. Which four items would you choose? A.A: Um… cheese, shepherd’s pie, pasanda kebab and peanut masala. So no veggies and fruits, I’d probably die of some deficiency. Small Change: Where would you like to go for your next holiday? A.A: A small village somewhere high up in the Himalayas. Copyright 2019 © Society for Development Activities.